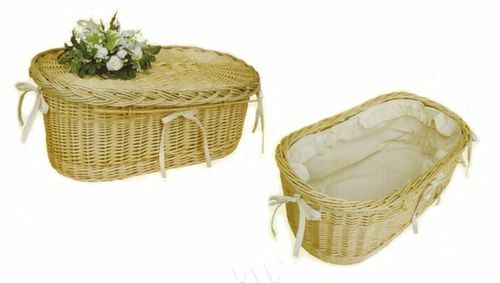 Artisan-Made Coffins - Quick-Tour: 4.4 Somerset Willow - the "Moses Basket"
4.4 Somerset Willow - the "Moses Basket"
This is a sweet basket-style coffin made of naturally peeled willow with a unique rise to the head portion to emulate a crib. The simple cotton liner is tied in. Losing a young child is difficult enough, and this presents a softer and more natural alternative. Colored bands and willows available as a special order option.